Over the last year and a half, Boston emcee M-Dot has garnered a tremendous amount of critical acclaim with his debut “Ego and the Enemy.” After several tours, a plethora of music videos and countless feature placements, M-Dot is back in the studio working tirelessly on “Ego and the Enemy 2” and promising a follow up that will surely top the first album. 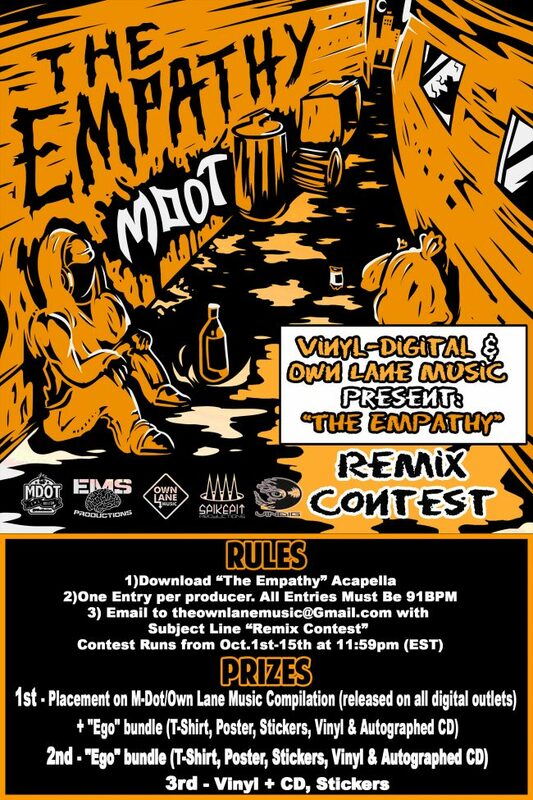 In the meantime, M-Dot and label Own Lane Music have joined forces with worldwide vinyl retailer Vinyl-Digital.com to present “The Empathy” Remix Contest. Producers will have a shot at remixing M-Dot’s “Ego and the Enemy” single “The Empathy” originally produced by the legendary Large Professor. Check out the contest details below.